How can textile ecology impact on your specialism? My specialism being knit, although I like to believe it’s spinning, How can how I knit or make yarn impact on the planet? All the way home and much of today I’ve been thinking. Is it possible to produce a knitted item without impacting on the environment? University doesn’t seem to give me time to really explore the questions it raises, I don’t have the time to create a large item, but perhaps a hat or a pair of gloves. A basic knitted hat, bought in a high street store would set you back £5-£20 depending on the quality and materials used, but the processes that hat goes through to be made has a high impact on the planet. Cheaper items are rarely 100% pure wool, most often acrylic, so not only do we have the cost of producing the wool but also the costs of chemically producing the acrylic. The process to make the yarn goes through similar steps as it would hand spinning wool, just a faster process. Electric trimmers to shear the sheep, if the wool is British it might be shipped to China or India to be processed and made then shipped back to the UK to be sold. The wool would need sorting, washing, carding prior to being spun and plyed. If the yarn is dyed (most likely) it will be dyed using chemical dyes which again effect the environment and in severe cases contaminate the water. The hat is designed and knitted on machines, hand finished, labels attached, sealed in a plastic bag perhaps then boxed to be shipped to the UK. The process could be improved by using British wool and a UK factory to prepare the fiber instead of shipping it abroad. I could be knitted in the UK and packaging could be improved. My question is though, could the whole process be done without machines, waste water, chemicals and even travel costs? 1. Sheep – Could I have sheep? Well, not really. My little council flat has a nice garden but it they ask enough questions just to have a cat. I can just see their faces if I ask if I can have some sheep in the garden. An alternative is to buy the fleece straight from a farmer. Although most British fleeces go to the British Wool board there are still farmers that see fleece as a waste product. Many of these fleeces though are mixed breeds and the quality of the wool might not be suitable for clothing. There are some good fleeces oout there and Ebay have a regular supply of sheep owners who have a small collection of pure bred sheep. As much as I moan about British alpaca I admit I have an alpaca fleece. I bought it for £5, it’s nice quality, clean, hand sheared on a farm in South Yorkshire and sold to a woman who decided she would dye the fleece and make a lot of money. Realising how time consuming this all was she gave up and I bought it to save it from being put in the bin. Well I have my fleece, £5 spent and a 1 hour car trip to collect it. 2. Shearing – The fleece I have was hand sheared with hand clippers, no electricity used. This is an old way of shearing and rarely used. I don’t know how I feel about hand shearing, using electric clippers is a smoother way of shearing and I think the sheep appreciates it. For that reason I think I will forgive any sheep shearers that use electric. 3. Skirting – Ideally this is done outdoors. It’s where you open up the fleece and seperate the sections. It also lets you pick out some of the larger bits of waste from the fleece. The neck and belly is often softer and used for finer products, back used for rougher projects, but this all depends on the breed. I would do this by hand on the floor or table if big enough and with a bin liner for a base to clean up the left overs. Fleece I don’t want to use can be left for bird nests and given back to nature. 4. Washing – You can wash a fleece in a top loading washing machine, but most UK machines are front loading. Hand washing can be done with hot and cold water and a little detergent. In “Three Bags Full” (1) Judith MacKenzie describes a process from New Zealand where hot water resources were scarce. Fleece was fermented in cold water. This technique uses the natural soap (Suint) found in the fleece and cold water. No chemicals or hot water needed and even better, the water is kept to use for several months. On a down side the process is very smelly, so I would need to do it in a garden and since my garden isn’t fenced in and the fleece is left for several days I might find someone has kicked over the bucket of fleece and I lose the whole project. This might be where my parents garden comes in handy. The great news is that rain water works best for fermenting. 5. Carding/Combing – Any day now I have a pair of beautiful English combs arriving through the post so I can make my own tops (not particularly relevent to tell you that, but I’m excited). There are people who claim the mechanical process of carding wool damages the fiber. Norman Kennedy, in “From Wool to Waulking” (2) suggests the heat and stress put on fiber from modern mechanical machines weakens and breaks the fibers making the yarn weaker than hand carded fiber. This is something I would like to look at. I have both a drum carder and hand carders and could hand card the wool, once I get my combs I can also produce worsted as well as woollen yarn. It’s a time consuming process, and the drum carder makes it a quicker process but it doesn’t use electricity. 6. Dyeing – I like chemical dyes, but for this process I want to find a natural dye that is environmentally friendly. Many mordants give off toxins that are harmful, but the natural dyeing process can be used without mordants. There are also plants/vegetables like rhubarb that act as both a dye and a mordant. Even with natural dyeing the water has to be heated and simmered. Solar dyeing on the other hand uses cold water and the heat of the sun to dye wool. Mother Earth News has some easy step by step instructions on dyeing this way. 7. Spinning – Very much the easy part. 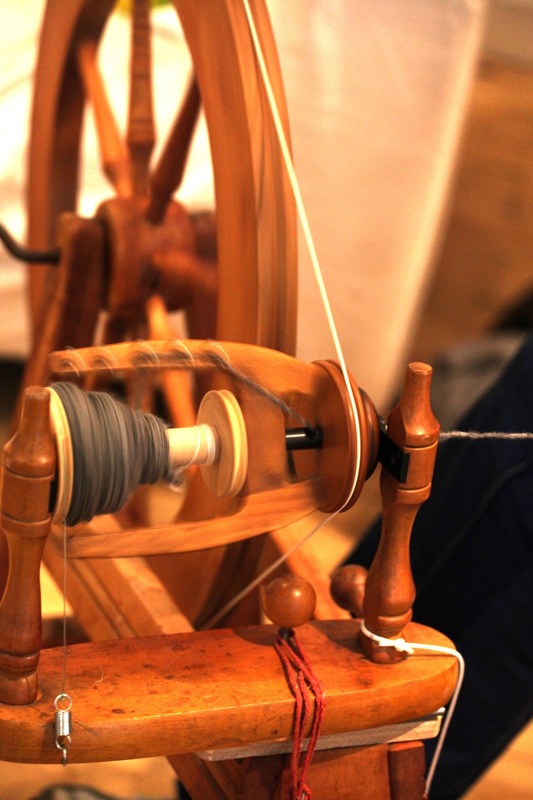 Do I spin worsted, woollen or semi-worsted? long draw, short draw? Do I ply it as a double, a nice round three ply or cable it? Am I wanting thin yarn for a shawl or thick? What about art yarn (although isn’t all handspun yarn an art form?) Boucle? Thick and thin? These are the easy questions. 8. Finishing – Final washing of the yarn, can I avoid using hot water? perhaps I could try solar washing like the dyeing process. I could try brushing the yarn. 9. Knitting – Of course hand knitting will be the way to knit the hat. A plain hat or a bit of cableing to show off the yarn? How about a button made from a slice of found tree branch? 10. Labeling – What kind of label would suit an item made in this way? No plastic bags, or colour printing. What about a simple brown label tied with string? What I thought was going to be a diffiuclt if not impossible process actually could work. With the right resources (outdoor space) and equipment that I already have on hand I think I could actually produce an item using no chemicals, electrical equiptment or waste. The question is though, would this work? I’m estimating, all in all this is one months worth of work. Fermenting and dyeing are slow week long projects, but the other processes are time consuming – very slow. If at the end of it I was offered £20 for a hat I think I’d be a bit miffed. The price would be higher than normal, but the story behind the hat…Wow. Would people pay for that? On Saturday 7th June we’re making Felt Brooches. I’ll try and get some instructions here before Saturday for those who can’t make it. This shop found on Dawanda has some great little brooches with obviously a lot of hard work gone into each one. This little fellow I really like though. I love his multi-coloured mohawk and cheeky little smile. Just what is needed for the summer. Her shop on Etsy is chock-a-block full of cute little brooches all of which look amazing. It’s making me very hungry. The detail though is stunning, what a fantastic brooch though. If you’re in a healthy mood though you can choose a ploughmans lunch of beans on toast. All great british food and since it’s made from polymer clay it’s not going to add any calories either. I’m often stuck in the world of Art OR Craft, like many I imagine. Am I a crafts person or an artist. Annie’s work though successfully brings Art and Crafts together. I love these brooches from Israel made from suede and felt, with hand painted facial details. I just don’t know which one I’d choose, but she has a great Rockabilly one in the shop at the moment. So Five different styles of brooches. We’re making our own brooches this Saturday at Inkwell Arts (7th June) 10.30am till 12.30pm. £6 each or £9 for parent and child. We’ll be drawing our own patterns out a bit like our cloud brooches but let’s see how creative we can be. 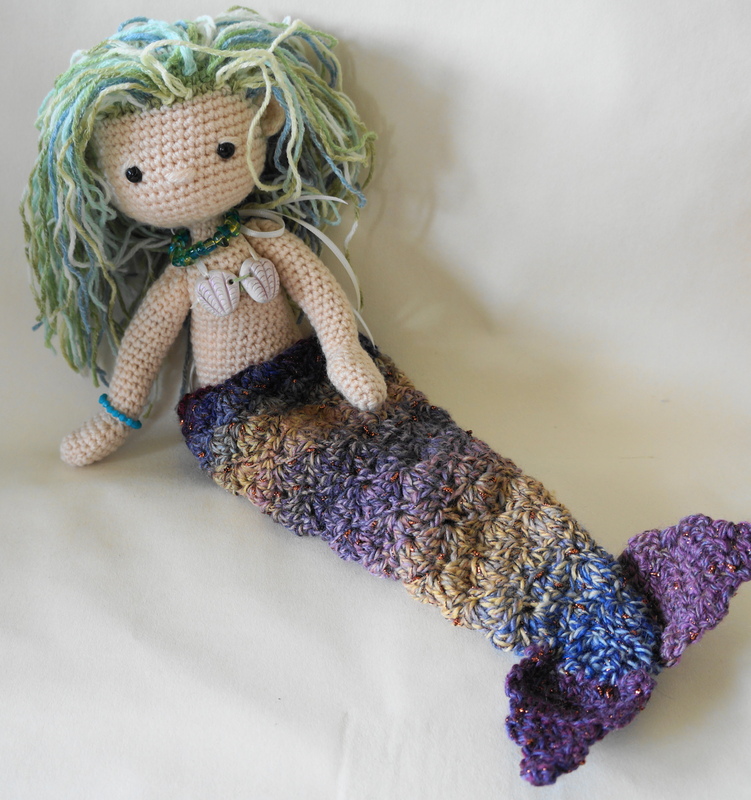 There are a lot of mermaid dolls out there at the moment, most of which have the tail sewn as part of the body. This pattern has a removable tail, so just like the little mermaid, you can remove it when your doll wants to have legs. It’s made from Sirdar’s Giselle yarn. Normally I think of a pattern and grab the wool I need, but this was a different process in that I saw the wool and saw a mermaid. Other Aran weight yarns can be used, but the gold glitter and shades of Giselle yarn set the outfit off perfectly. Another change in this pattern is that is isn’t just a crochet pattern. The bra is made from polymer clay, if you’re a beginner to this medium then this pattern is a great way to try a new craft. The tools you need are all easily found. There are also instructions to make the beaded necklace, again introducing you to simple bead threading. Am always happy to get emails from people regarding the dolls and crafts. Please ask questions if you have any. I know, she’s great isn’t she. Her hair was made using Sirdar Crofter DK, which gives a seaweed look to it. The beaded necklace and bracelet were from beads found in hobbycraft. Let me know what you think, give me ideas for future outfits, send me your photos. I’ve posted two patterns, one in UK terms and one in US. Hope that helps my fellow Brits!!! I saw a comment recently that mentioned how little they were selling on Etsy at the moment. They said they had spent over £100 listing things with little sales and wondered if it was worth continuing. I responded with a quick agreement, but then started thinking, my crochet patterns sell ok, but then they’re on Ravelry. Looking at my other items and patterns I notice sales are low to non-existent. When choosing the website to sell products how do you go about it? I found Etsy through another Etsy seller, a friend who also struggles to sell her stunning pieces of jewellery. I also tried Folksy, but didn’t try too hard since I believed Folksy targeted the UK market and Etsy (targeting worldwide) would give me a wider customer base. I forgot the basic rule… Become a shopper. Years ago, I worked as a waitress, many moons ago! I remember the manager giving me a special task, come to the restaurant as a customer, not as staff. Together we walked through the doors, the menu we’d had for ages, suddenly seemed old, decorations hid important information… the list went on. When you chose the website to sell your products on how did you find it? Did you search places to sell, or did you search places to buy? Instead of choosing your marketplace as a seller, choose as a buyer. In the first tab type “selling handmade gifts”, that might be how you chose where to sell (searching as a maker and seller of crafts). My google list puts Etsy at number 4 on the page. I’m in the UK, so it’s probably different for other countries. The three before Etsy are UK market places including Folksy. Now try again as a shopper. How would you search google if you were a buyer of handmade gifts? Again, this will be UK only, but worth trying in all countries. Etsy doesn’t appear on the first page. If you change the search to “buy handmade gifts” it comes third, but would you really search like that? That’s how you should be choosing your market place because that’s how your customer finds you. In defence of Etsy, it’s a mainly US marketplace with the majority of customers from the US. I think it’s a fantastic place to sell your items because it’s widely recognised. I’ve just posted a rattle to the US and very pleased I was to do it. However, as a UK maker and seller it might not cover all my bases. That’s why I think a second shop might be in order. The top 2 searches are MISI and Folksy. Folksy being identical in format to Etsy, but a stronger emphasis on Handmade, and for UK sellers. MISI (make it sell it) is something I’ve only just come across but looks very similar to Folksy (I think it looks like they used the same site designer as well). So why a second shop? Here’s my thinking (again as a buyer) I’m from Yorkshire, a Yorkshire lass and proud of it. I also like handmade gifts. As a shopper – and I think we’re all like this at heart – I buy as local as I can. My tea is Yorkshire tea, definitely NOT Lancashire tea (why do they even sell it in Yorkshire shops?) Yesterday when I bought eggs from the supermarket I bought eggs mainly because of the box style (yep, I’m that shallow) But again, how many of us buy the packaging before the product? I cut my choices down to the yellow happy egg company and Yorkshire eggs. I bought Yorkshire eggs. Price had little to do with it. And that’s why I think a second UK shop would be a good option. If I saw nice things from 2 sellers, one being a UK seller and one being a US seller, I’d choose the UK seller every time. That’s not anti-US, that’s human nature. I would support a UK person before anyone one else because it’s more local. It’s also often cheaper because of postage. I expect it’s the same in the US, an American, buying American before UK because they are supporting their fellow country folk. That’s why a second, UK based shop might be a sales booster, and lets face it, I’d pay the small fees for a second shop if it meant bigger sales, wouldn’t you? It’s always worth looking at yourself from a buyers point of view, how would a buyer find you? Places, websites and magazines that are aimed at sellers may not always give the best advice, but show someone something you’ve made and ask them to find it on the internet. Watch what they type and how they try and find you. If they don’t find you, why?